Summary: While this one might appear as another extremely informative, refreshing read from Rujuta, it, in reality, sounds starkly familiar if you have been following all her writings till this time. On the contrary, I’m sure you wouldn’t mind if bible or any of your religious scriptures for that matter is read to you time and again, would you? Yes, this one is another health reference book for keeps. My take: I find the title of the book a bit deceiving, for the author does talk about the hormones and the problems them going haywire might cause to your body, a majority of it is about your general health and how changing your lifestyle actually reflects directly on your well-being. So, here, she loses marks for not being able to decide the title well. But you know what, I read on a popular website that one in seven people all through the world suffer from diseases related to thyroid and there she scored a homerun! She pretty well knows what she’s talking about. To be honest, this one, health, is one of my favorite genres. I love reading any new content I get my hands on and I must have digested by now the books Rujuta has written, three in the past. There’s a problem with good authors being extremely explanatory to their readers – it leaves them with very little they could possibly share in their next compositions. She’s kind of tried to drain everything she ever knew down her reader’s mind in the past and, now, no matter what new she comes up with, it all sounds old-hat. This book, though clearly says that it’s been compiled from Women and the Weight Loss Tamasha, follows similar line of content as her previous books. I see a lot of her readers scoffing at her writing style – I find that totally appropriate considering the segment of readers she is writing for, Indian women who love being told what to do. Her writing style, while on one hand is colloquial and desi, on the other it’s tad too authoritative and casual. I think she could surprise her readers with better English next time! Furthermore, this low-priced edition addressed exclusively to PCOD- and thyroid-related disease sufferers is actually meant for everyone who wants to know the key to a healthy life. The author has been actively advocating the value of local, fresh food and that pretty much sums up the storyline of this book. She is also one of those few sports nutrionists and diet counselors we have in India who push people to eat what they have been asked to avoid. Not only this, she appears as a beacon of hope to people who hate working out, for she shows so many cool after-effects to ‘gymming’ that everyone reading her feels inspired to pull up his socks, like literally. I did not like the cover much, for I just could not relate with the acronym “PT” used in bolds on the face of the book. Was it to sum up to use the initials of both the diseases she’s tried to talk about in the book – PCOD and thyroid? Very bad and unimaginative choice, I must say. Final word: This book would not disappoint you if you have been looking for any answers to PCOD- or thyroid-related questions and it wouldn’t disappoint you either if you have been just trying to find an informative health non-fiction in this. 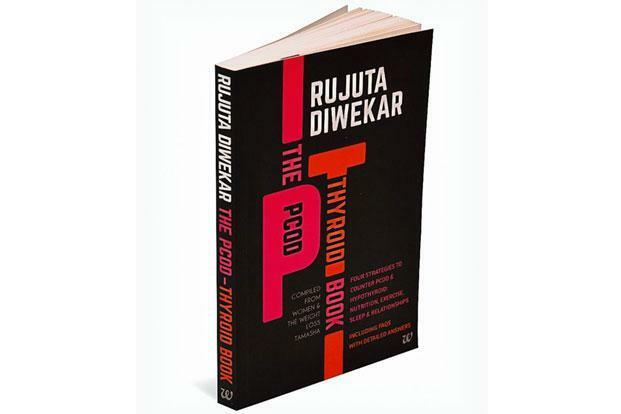 This fourth book by Rujuta Diwekar is a brief, informatory book about women’s health in general and sounds totally applicable to men’s health, too.